Two years ago, I believed I was a competent rider. I was living in Dallas, and I rode The Little Rat all over the city, even occasionally leading rides. I didn’t take unnecessary risks, I rode within my limits, and I felt under control and confident. What I didn’t know at the time was that I had reached a pivotal moment in my motorcycle career, a phase I’ve come to call the intermediate rider plateau. What happens after you’ve “learned to ride”? When you first start learning to ride, everything is a challenge. Your muscles are still calibrating, learning how to achieve smoother stops and starts, smoother shifting, and more stability. During this phase, you learn and improve with every ride. Over time, these basic operational tasks become easier and easier. Then, one day, you realize that nothing much surprises you on the road anymore. You begin to feel confident, competent. The basic tasks of riding — shifting gears, braking and balancing — have become second nature. And that’s it, right? You can ride a motorcycle — mission accomplished! That’s what I thought, too. And then, I moved to Portland. Oregon’s terrain is wildly different from the Dallas roads I was used to. Dallas streets tend to be wide, flat, and straight — built to quickly move large vehicles across the flat, open North Texas terrain. But in the Pacific Northwest, the roads are at the mercy of the trees, hills, rivers and mountains. Even in the city, streets are smaller and hilly — and you don’t have to go far to find yourself on winding forest roads. After my first encounter with those winding, hilly roads, I realized my confidence as a rider had depended on those flat Texas roads. My cornering skills were worse than I had imagined. On that first ride, I slowed down to 20 or less around every turn. At that moment, I knew I wasn’t yet done learning to ride. What I didn’t understand, feeling competent and confident back in Dallas, was a simple truth about physical skills (motorcycle riding included): If you don’t practice it, you can’t learn it. Because I only rode on gentle, well-paved roads, all I knew how to ride on were gentle, well-paved roads. When I moved to Portland, I was exposed to an entirely new kind of riding, which exposed my weaknesses as a rider. To learn to ride safely in Portland, I needed to improve my skills. You might be thinking, what’s the big deal? After all, I had to improve my riding skills because I moved. If you’re not riding anywhere different, why would you need to change anything? The problem is that even if you only ever ride the same, predictable routes every day of your life, riding is not a predictable activity. Someday, a car will pull out in front of you. You could misjudge your speed going into a turn. You won’t notice a massive pothole until you’re almost right on it. The question is, in those situations, will you have the skills you need to keep yourself safe? If you haven’t practiced quick and safe braking, you could end up hitting a car you should have been able to avoid. If you’ve never practiced negotiating tight turns at speed, you might not know what to do if you hit a corner going too fast. No matter how confident you feel in your daily rides, one truth remains: If you don’t practice the skills you need to keep yourself safe in an emergency, that emergency will be your very first practice session. How will you handle the intermediate plateau? If you’re a new rider and you’ve reached the point where you’ve begun to feel confident and competent on your motorcycle, you should be proud of yourself. Riding a motorcycle is one of the more complicated things we do regularly: the 1974 Motorcycle Task Analysis report found that there were approximately 2,500 “tasks” involved in riding a motorcycle — compared to just 850 in driving a car. But now that you’ve reached this point, it’s time to ask yourself, what kind of rider do you want to be? Do you want to be a rider with passable skills? Or would you rather be a rider who takes control of their learning, rises to meet new challenges and is confident in their ability to take responsibility for their own safety on the road? Unfortunately, most riders are the first kind: according to the Motorcycle Safety Foundation, 90% of their students nationwide only ever attend their basic motorcycle course. 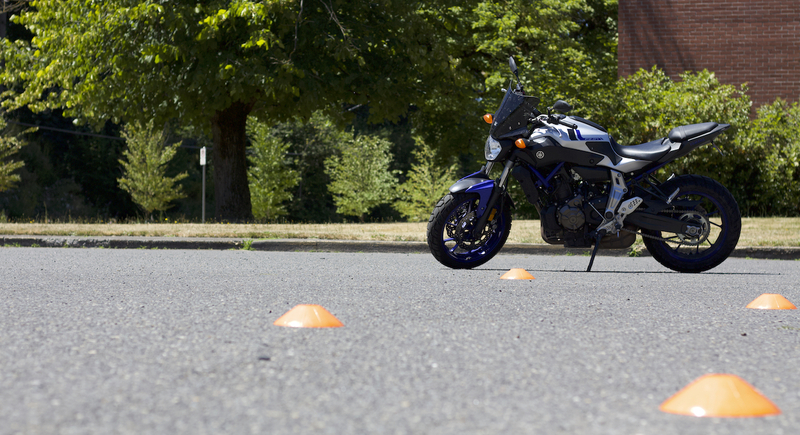 If you’d rather be the second kind, it’s time to take an advanced motorcycle class. At this point, you might be thinking: No problem! If emergency skills are something I need to practice, I’ll get myself some cones and do some parking lot practice. I’m never going to discourage anyone from parking lot practice, but I want to strongly encourage you to also seek out a class. By attending an advanced motorcycle class, you gain access to a trained professional whose sole focus is to help you improve your riding. They will show you new tactics you might never have considered, and call out bad habits you didn’t even know you had. After I discovered my cornering weakness, I took an advanced riding clinic that taught me techniques I can use for better balance and tighter low-speed maneuvers. But that class didn’t just help me improve my riding — it showed me that I’ll never truly be “done” learning to ride. You don’t take advanced motorcycle classes because something is wrong with your riding. You take them because there is always something that can be better. I don’t know about you, but I look forward to the journey. I had already “bought the ‘Take Advanced Classes’ Car”; but outside of one-day hoping to learn to ride track and dirt, I hadn’t given any thought to any other courses … until I found myself on the near 85-degree streets of Washington in the PNW in a Chevy Impala just this week. I had never been on a hill of such steep grades on any kind of motorcycle; and I genuinely wonder how well I could handle it. We don’t have anything remotely close to that in Maryland and less so in Florida, where I learned to ride. Hahaha yes! I’m so glad I’m not alone — as riders we just start to get comfortable in our own bubbles, and we forget that our skills don’t necessarily translate to all situations. Those hills in downtown Seattle are no joke!